The National Association of Mens’ Morris & Sword Dance Clubs, founded in 1934, of which we have been a member since 1981. The local ladies’ team and our sister side that we frequently team up with when dancing out. They perform traditional North West Morris Clog and Garland dances collected from the mill towns of Lancashire. 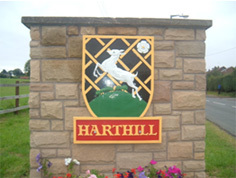 The village of Harthill, the most Southerly village in Yorkshire. This website provides information on the village and its amenities, such as the village hall where we practice and local businesses. This website is to acquaint you with the activities of some of the more eccentric members of the Morris in the UK and elsewhere.